I hope that these papers fulfil the requests which you itemise but if not I have much more information. Unfortunately I am a compulsive hoarder of information and still possess many of the copies of ADAS publications both for the Berkshire, Oxfordshire and Buckinghamshire areas and for Hampshire, the Isle of Wight, Surrey, W.Sussex and part of Greater London. These papers show how farmers have been advised over the years in almost all aspects of chemical and feed use. In addition I have a 1962 copy of the American publication Feeds and Feeding by Frank Morrison first published in 1898 which illustrates the widespread use of meat products in animal feeds as do my two copies (1968 and 1976) of the Agricultural Notebook by Primrose McConnel (Butterworth & Co) first published in 1883 and rewritten by Ian Moore. An indication of the political effects on pesticide use is found in the 1978 edition of the Anatomy of Agriculture by Peter Wormell published by Harrap and Kluwer of London in which the Heath government's failure to implement an 80 page document calling for greater controls of pesticides is reported together with the effects of pesticides on wildlife and crops. Returning to my own experiences it might be interesting to note that the feed processed by our cubing machine reached very high temperatures during the cubing process. A 7.5 HP motor forced the grain through a steel die ring which became so hot it could cause burns and turned the moisture within the barley to steam. This may or may not be relevant. I have contemplated the reasons for official secrecy regarding the effects of OP pesticides and wonder if the historically close links between the chemical and drugs companies and the Ministry of Defence may be responsible. Some time ago I became aware that the Ministry of Defence released Brucellosis in Germ Warfare trials off the Isle of Wight and the Scottish Islands. When I first came to Island farms as a student I worked with a herd which had been devastated by the disease. The farmer was also a sufferer. I see in the 13th edition of Blacks Veterinary Dictionary that the Isle of Wight and the Scottish Isles were the first areas to be included in an eradication programme using the S19 Vaccine. That programme was to cost the country and the farming community a very great deal both in health problems and financially. I do not believe that these events are unconnected. Perhaps the OP experiment and BSE are rooted in the same soil?? A request was made that I provide the name of the Ministry Vet who notified me by telephone about our BSE cases. I have searched my diaries and discover that (name provided) contacted me on 28th January 1993 requesting information on the cow born on the 12th October 1988, its dam and the type of food fed. I suggested that this animal would disprove the feed theory. The following day she rang again regarding a second cow born on 6th October 1986 and took the details I had found regarding Dalgety feeds for calves and cattle, the history of the dam of the first BSE case, and the fate of all the related offspring. I mentioned the use of fly tags and disect on the animals and was advised that the calf feed would have caused the BSE despite the fact that it would have been purchased well after the ban on MMB and that neighbours with BSE had never fed specialist calf feeds. The Ministry did not contact me again but on 23rd June 1993 the former owner of the herd visited me and informed me that a third animal had been a confirmed BSE case. There were no more contacts from the Ministry. At this time there was much controversy over the use of OPs used in sheep dips and they were reportedly to be banned whilst under investigation as broadcast on 7th February 1993. I have also been requested to provide details of letters written to officials and to indicate content and what response if any was given by those involved. I fear it is a long and troubled list but I have tried to make it easier to follow by colour coding (not here) the dates and names for different departments. 17.3.98 to Dept of Health Bridget Holley requesting details of DSS Involvement in food safety and chemical regulation, also mentioning NPU refusal to release medical records. 11.3.98 to Prime Minister re dangers of chemicals and government department failures. 5.1.98 Fax to Brand Records,HSE,regulations. 20.2.98 HSE open letter in IOW County Press suggesting the lack of wisdom on the part of the HSE and that it was strange that HSE can write public letters yet refuse to answer private correspondence. 20.2.98 HSE Letter in IOW County Press excusing inaction on Pesticide Poisoning cases in attempt to discredit the article written on my case. 27.1.98 Brand MP Believing Guy's unable to help. 23.1.98 Guy's/St Thomas Medical records 272 pages many vital and requested records missing and repetition. 9.1.98 Brand MP his last communication with Guy's was in October. They claim to have sent full copies. 4.12.97 Downing St with apologies for no response letter referred to MAFF for reply. 28.11.97 PSD Davis for Prime Minister. 4.10,97 PSD aware of your concerns. Nothing to add. 9.11.97 to Prime Minister re failure to respond and resolve to ignore matters of fact. 4.11.97 To Countess Mar with copies letters to PSD and Prime Minister plus queries on Evaluation paper and details on cholesterol as base for all hormones and possible effect of solvents on same. 20.10.97 Brand MP forgot to enclose question to Minister of Health on chemicals but OP experiments on Children "are quite ethical" despite call for ban Requests permission to write to Guy's re records. 8.10.97 Guy's St Thomas Stirling wanting list of each test report which is missing. 3.9.97 Fax to Guy's St Thomas Complaints dept re dishonesty regarding records listing past parcels each purporting to be the full and complete records but each later admitted to be incomplete. 1.9.97 Brand MP Tessa Jowel acknowledges OPIDP? 1.9.97 Guy's/St Thomas Stirling claiming to have sent 2 full sets of records, give exact details of missing papers. "We are at a loss to understand"
18.8.97 to PSD Mascall re action of chemicals on enzymes and link with BSE/CJD and Dairy workers, the errors in assuming safe ADIs due to incorporation methods resulting in excessive additions, the false claims that PSD did not know the approval numbers, the Sybol experiment and the inconsistencies in advice given by the PSD and Zeneca, the additional potency of solvents used , MAFF involvement with the 1993 Guy's OP victim tests, the recognised 40,000 OPIDN cases, PLUS photographic evidence of the prolonged toxicity of the "weak" Sybol OP garden formulation which carries no health or protective clothing guidance. PDC3 Copies also enclosed. 15.8.97 to Health Ombudsman Nisbet re surprise at impotence of his office, Guy's dishonesty, NHS costs. 13.8.97 Health Ombudsman Unable to help since the complaint was after 1.4.96. Take Legal Action. 14.8.97 to PSD Mascall thanking for information confirming my views, Zeneca trying to escape legal responsibility, photocopy of warning sticker complete, query MAFF study of Pirimiphos Methyl, PDC3. 7.8.97 to High Court in surprise that papers returned denying accuracy of writ number. Resubmitted. 30.7.97 to High Court re inability to obtain information from lawyers representing my case and concerns over apparent deliberate lack of action. Unable to even obtain a copy of the writ. 29.7.97 Brand MP raising the issue, Awaiting response. 12.8.97 High Court with copies of Writ and papers filed Advised to contact Citizens advice for help! 27.7.97 To Perry MEP re concerns over GMOs, glyphosate, and total control by a few companies and suggesting the Ethics Committee investigate the chemical and drug companies and patents for life forms. 15.7.97 Fax+post to PSD Mascall re lack of proper residue testing, dangers built in to ADIs, reliance on unchecked manufacturer information on chemicals, Responsibility of PSD for confusing labels, influence over Guy's,long protection afforded to grain by treatment, errors on half-life and possible influence of the fluoride and or chlorine in the public water supply. Disappointed that no urgent action was taken before harvest. Australian case against ICI for failing to provide government with accurate safety data. 10.7.97 PSD Mascall for Minister promising copy of the Pirimiphos Methyl Evaluation Document. Post Harvest treatment must be declared in International Trade and such exports are now legal with MRLs across the EU. 8.7.97 Fax to Health Ombudsman re failure to understand request advised by local Community Health Council. Government agencies are failing to comply with government's own rules and regulations. 4.7.97 Health Ombudsman Nisbet explaining that the Ombudsman cannot re-open an investigation, that a further complaint should be made to the Trust and that failing that legal action was available. 20.6.97 to Industrial Injuries Council requesting copies of ISBN 1 85197 770 8 "Notes for the Diagnosis of Prescribed Diseases"
Not available. The Council Advises the DSS on eligibility for benefit. 1.6.97 to Cunningham MP re complacency shown by PSD when they replied for him-passed again to PSD! 4.5.97 Cunningham MP "I implore you to act quickly on the OP question" PDC3, wildly fluctuating levels incorporated into grain, inaccurate figures, attempts to hide the true facts, dangers to children, Zeneca warnings regarding ingestion of the chemical, costs to the Health Service and Legal Aid fiddles by lawyers. 30.4.97 to Data Protection Agency as advised by local Advocate's office listing inaccurate areas. 20.4.97 to Legal Aid re appeal and evidence available proving suppression of factual evidence. 18.3.97 to Zeneca Lewis congratulations on avoiding the questions but inconsistencies remain Zeneca states "We have no direct evidence of the stability of pirimiphos methyl"
17.3.97 Zeneca Lewis though correct the extracts you quote are taken out of context. PSD oversees risk. 17.3.97 Fax to PIAP Osman re Zeneca unable to respond, forwarding to MAFF & HSE, & relevant Acts Raised subject of PIAP member involved with Kent Orchard OP PPE experiments. One man died? 5.3.97 to McDonald MP with list of local illnesses in farmers and those near farming areas. Pesticide links? 3.3.97 Fax to PIAP re inconsistencies in advice and information provided by Zeneca. Why no Action? 22.2.97 Fax to Zeneca Lewis re failing to address the questions raised 19.2.97 Zeneca Lewis No fault in their actions. 6.2.97 Guy's/St Thomas McEnroe waiving all charges. 9 pages sent. Do not hesitate to ask for help. 7.2.97 Fax to Morley MP thanking for reply for Strang and re links with OPs and BSE suggesting they examine ICI links to Gulf War and results of enzyme damage. Diazinon and Fenthion animal deaths and intakes of glyphosate, Actellic and sheep dip. Future generations require action. 6.2.97 Morley MP for Strang MP re Thatcher links to ICI "Labour Government would certainly" examine OPs. 23.1.97 Guy's/St Thomas Kelly 43 pages records "I have copied all the sheets you have asked for"
21.1.97 Fax to Perry MEP Aware of the economical implications to Agriculture but the risks are too great to be ignored. It was illegal to poison food in 1938. Is it legal to do so now? The Commissioner for Human Rights was unhelpful but a poison is injurious to life and is administered deliberately despite the greater risk to children and the unborn and manufacturers recommendations to avoid contact with food. High levels were found in grain which forced the introduction of the declaration scheme at about the same time as the introduction of the offal ban. Information is being deliberately suppressed. Enzyme bonding and the corruption of the enzyme processes can cause a host of unexpected results and because they create the building materials for life the unborn are at great risk from deformities and nervous system disorders including CJD and BSE. Enzyme action may also explain the sensitivity to solvents and even to peanut oil since peanuts absorb large amounts of chemicals. The risk of OPs has been known for decades but little is done to support victims and their families while the chemical companies earn vast fortunes selling the drugs to treat the symptoms they themselves induce.I would be interested in your views. 16.1.97 to PIAP Osman Suggest that you urgently review the information in your files concerning the toxic potential of all products containing pirimiphos methyl. Tests disprove safety claims. 10.1.97 Fax to Guy's/St Thomas McEnore Referring them to letters of 6th and 25th November explaining that they were mistaken in their belief that I had not returned a witnessed request for my Medical records. This sorry tale continues in the same vein back until 1992. It is clear to me that there is collusion within all government departments in their attempts to protect both themselves and the chemical companies. Truth means nothing. Facts are cast aside. Statiics are corrupted. Lives are lost. BSE is a symptom. MAFF and the Health and Safety Executive are failing to properly monitor effects and with the DSS have influence over the Medical profession. All are involved with the process of setting safe levels in food. My considered view is that the government is now controlled by the chemical and insurance industries. The Legal system and science itself have become corrupted as a result. Every day, one million U S. children age five and under consume unsafe levels of pesticides that can harm the developing brain and nervous system, according to a new report by the Environmental Working Group (EWG). The report, based on an analysis of federal data, found that most of the risk to children comes from five organophosphate insecticides: methyl parathion, dimethoate. chlorpyrifos, pirimiphos methyl and azinphos methyl. The foods most likely to contain unsafe levels are peaches, apples, nectarines popcorn and pears. Among baby foods, pears, peaches and apple juice most frequently had elevated levels. EWG undertook the study to monitor effectiveness of the 1996 Food Quality Protection Act. which requires all pesticides to be safe for infants and children. "It's been more than 18 months since Congress passed the Food Quality Protection Act," said Richard Wiles, vice president for research at the Environmental Working Group. "This study shows that every day, hundreds of thousands of children receive unsafe exposures, at precisely the age when they are most vulnerable to long and short-term brain and nervous system damage." The study found that approximately one in four peaches and one in eight apples have levels of organophosphate insecticides (OPs) that are unsafe for children The report stresses that the solution is not for infants and children to eat fewer fruits and vegetables, but rather "that baby food should not contain pesticides." said Wiles EWG says its report is the first comprehensive analysis of exposure to organophosphate pesticides in the U.S. food supply. It is based on more than 80,000 samples of food tested by the U.S Department of Agriculture (USDA) and the Food and Drug Administration, and dietary records for more than 4,000 children collected by USDA. According to the report estimates of the number of children at risk of exposure to unsafe levels of pesticides are conservative because children are also exposed to pesticides sprayed in their homes, schools and day care centers. In addition, the EPA's current standards are based on levels considered safe for adults The study estimates that as many as 3.6 million children aged 6 months to 5 years would be considered at risk from pesticide levels ii food if EPA set standards that complied with the Food Quality Protection Act, which requires an additional ten-fold margin of safety. EWG urges that the five OP pesticides be banned immediately for all agricultural use, and also recommends: -- a ban on all home and other structural use of OP pesticides -- a ban on all OP pesticides on commodities that end up in baby food -- safety Standards for all OP pesticides must be set at levels that are safe for infants and children -- additional deveopmental neurotoxicity studies on all OP pesticides in the food supply must be conducted before EPA adopts new OP regulations next year. The Chemical and food industries called the report alarmist and said it serves only to frighten parents away from wholesome food. "The food is safe and so are their children." said Jay Vroom, president of the American Crop Protection Association. 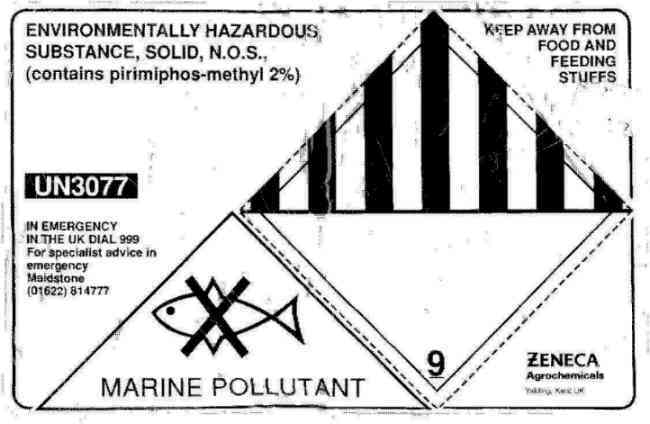 But EPA has already identified organophosphates as the top priority in determining whether to change the acceptable residual levels in food EPA will decide whether to set new standards for organophosphates in the food supply by August 1999. The agency could ban them outright or change the acceptable levels in foods. COPY OF ZENECA LABEL This is a direct copy of the label stuck to bags of Actellic Dust sold in 1997 to farmers for the direct application to harvested grains which include milling wheat, barley, rye, and oilseeds. Both the "bucket and shovel" and "metering" methods of incorporation result in "high spot rates" which can never be removed or, except by chance discovery, tested for in the normal way. Extracts were provided of text taken from "Feeds and Feeding" (A Handbook for the Student and Stockman by Frank B Morrison published in the USA in 1959 page 519 Pages 519 - 528) which refers to various feeds using waste meat products, and from "Farming" edited by Prof A.N. Duckham and published by Caxton Publishing Co in 1963 pages 93 - 94 which refers to feeds of meat origin. Also provided was text from "The Agricultural Notebook" by Dr Ian Moore First Published in 1883. This edition was printed in 1968 Published by Iliffe Books and pages 413 - 414 refer to meat based feeds and in later editions pages on 559-560. "Gentle Steam Extraction" processes are indicated as producing "Steamed bone meal" used for plant nutrients. Meat and Bone meals used for fertiliser are widely reported as is found on pages 114 and 116. This information shows that Meat and Bone meal sterilised with steam heat had been used as feed for decades with no health problems and indicates that something new had caused the BSE epidemic in cattle. To support the arguments put forward in this submission a further 12 copies of Agricultural Development and Adisory Service (ADAS) advice notices sent to farmers were provided. These proved that Government advised Farmers to use OP pesticides on cattle and sheep and that they recommended the use of more OP pesticides on crops to be grazed by animals and eaten by humans. The papers also indicate that the recommended disposal method for used OP sheep dip was to spread over land or use a soak-away. Both methods have since been discontinued due to the danger to grazing animals and contaminating the water supply.